The Common Merganser is not common in Tennessee during any part of the year. It is an uncommon to rare migrant and winter resident across the state found on deeper lakes and rivers. Interestingly, it apparently once nested in the state because 6 sets of eggs were collected in Smith County between 1896 and 1899. Currently, the closest breeding birds are found in Pennsylvania. The Common Merganser is a large fish-eating diving duck, and has a long thin bill with toothy projections used to hold slippery fish. In North America, they breed across Canada south to Pennsylvania in the east, and northern California in the west. During the winter they are found in ice-free portions of southern Canada, east and south to North Carolina, Kentucky, Arkansas, and northern Mexico. 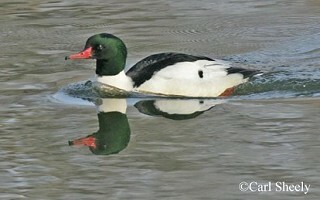 The Common Merganser is also found in northern Europe and Siberia. Description: This long, slender diving duck has a long, thin bill, and white patches in the wings, which are visible in flight. The male has an iridescent green head, a bright reddish-orange bill, and a mostly white body with a black back. The female is dull gray with a reddish head, a white chin, and an orange bill. Male Red-breasted Mergansers have a shaggy crest, a brown chest, gray sides, and a red eye. Females are duller with a shaggy crest and thinner bill. Male Mallards also have a green head, but have no crest. Winter loons can look similar, but have thicker bills, and more white in the face. Habitat: In Tennessee, found on deeper lakes and rivers. Diet: Varied, including small fish, insects, mollusks, crustaceans, worms, frogs, small mammals, birds, and plants. Nesting and reproduction: No known nesting records in Tennessee since 1899. 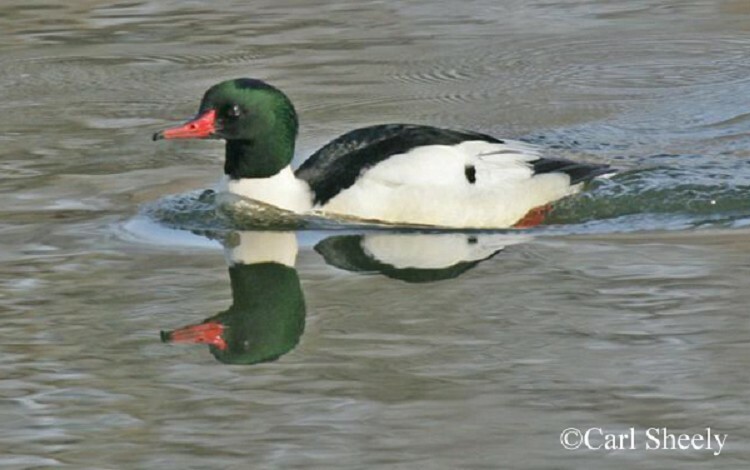 Status in Tennessee: The Common Merganser is an uncommon to rare migrant and winter resident in the state. They are usually found in small numbers from mid-November through early April. In the 19th and early 20th centuries, collecting the eggs of wild birds was a serious (and competitive) hobby among amateur ornithologists. They called themselves Oologists. This practice came to an end with the passage of the Migratory Bird Treaty Act in 1918. 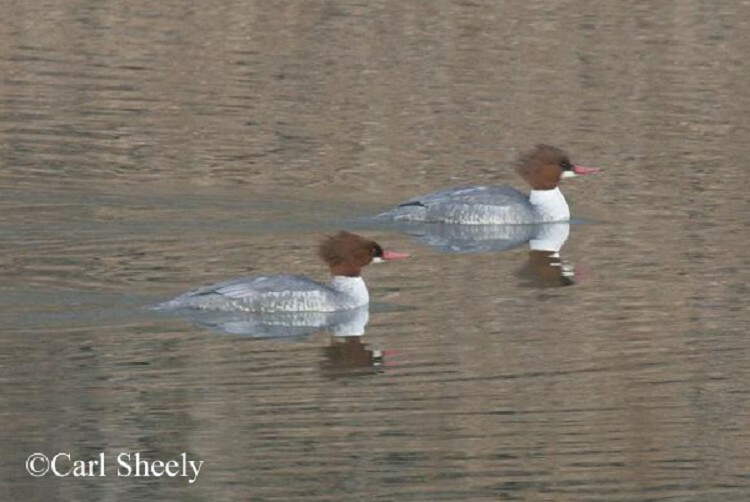 The six records of Common Mergansers nesting in Smith County, Tennessee come from oologist's collections from 1896 to 1899. These historic sets of eggs are now in the Field Museum of Natural History, Chicago, IL (1 set), San Bernardino County Museum, Redlands, CA (2 sets), Columbia-Greene Community College, Hudson, NY (1 set), and two sets were at the Western Foundation of Vertebrate Zoology, Camarillo, CA but are now lost. The Common Mergansers nest in cavities made by Pileated Woodpeckers or natural cavities. Where cavities are scarce, they will accept nest boxes and have been recorded using a rock crevice, a hole in the ground, a hollow log, an old building, and a chimney. Best places to see in Tennessee: Deeper lakes and rivers across the state. Tennessee NWR - Big Sandy Unit is a location that has Common Mergansers occasionally in winter. Mallory, M. and K. Metz. 1999. Common Merganser (Mergus merganser). The Birds of North America, No. 442 (A. Poole and F. Gill, eds.). The Birds of North America, Inc., Philadelphia, PA.